All Aces is a variation of Jacks or Better with increased payouts for 4 of a Kind and decreased payouts for several of the other hands. The game is only available at Microgaming casinos and The Casino Lobby. All Aces has a 99.92% payout, higher than any other video poker game offered by Microgaming. Autohold is not available for this game because of the low house edge. The table below lists strategy for All Aces video poker. Select the lowest numbered choice that you can form with your initial hand, then discard the remaining cards. Note that "high card" indicates Jack to Ace. 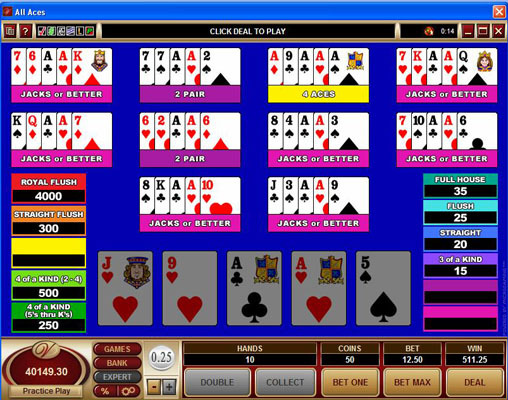 All Aces is available with Microgaming and softwares. See the payout calculator for estimating payout with modified paytables.